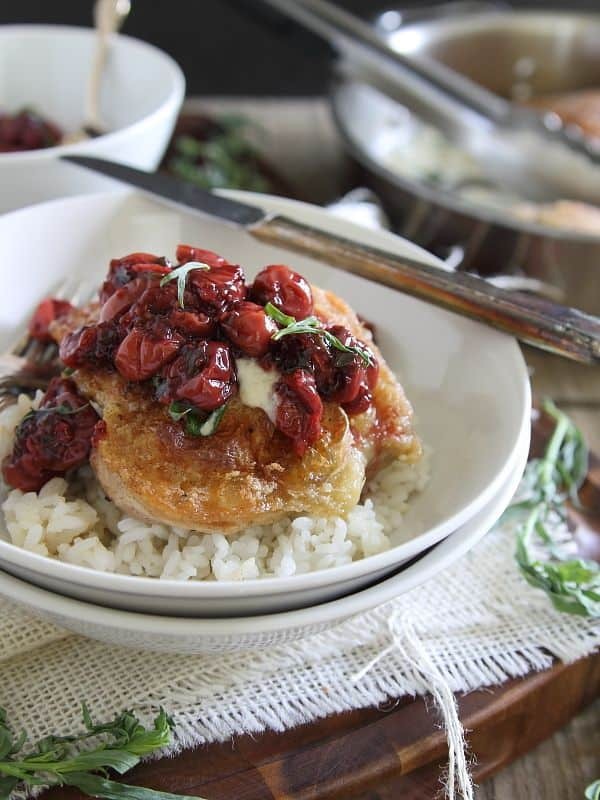 This goat cheese fried chicken with cherry tarragon sauce is crispy on the outside with a creamy goat cheese sauce and topped with tarragon tart cherries. Being productive on a Sunday can be filed under ‘things you don’t want to do after drinking 4 glasses of wine the night before’. Ginger tried to wake us up 3 times yesterday morning unsuccessfully before I decided around 10:30am my head felt ok enough to finally be upright. Upright and productive however, are two very different things. I had a to-do list about a mile long for this past weekend knowing I’ll be away for 4 days at the end of this week and accomplished exactly zero items on it yesterday opting instead to plant more succulents in tin cans for my kitchen window sill and lay in the sun on the front steps. I gave absolutely no thought to dinner until it became a necessity and then somehow this happened. It was one of those times where you have this vague idea of what you want, take out about 20 things from the fridge not sure what you’re really going to end up using and with every ingredient you add, the dish just morphs into something new. Most times, that ends up being a hot mess and elicits “sooooo, what made you make this?” kind of comments from confused husbands at the dinner table. Last night, he told me this could easily be a $28 dish in a restaurant. I think that makes up for at least 3 unaccomplished to-do list items. Not bad for a hung over cook. Combine the tapioca flour, mustard, salt and pepper in a shallow dish. Coat chicken in the mixture and set aside, reserve any extra flour mixture. Heat the olive oil and 1/2 tablespoon of the butter in a large skillet over medium-high heat. Once hot, add the chicken to the pan skin side down and cook for about 5 minutes until the skin is golden brown and crispy. Flip chicken and cook for another 3-5 minutes until chicken is cooked through. Transfer chicken to a plate and cover. Drain or wipe out the skillet, reduce heat to medium and add the remaining 1 tablespoon of butter to the pan. Once melted, add the chicken broth and goat cheese and whisk together until the goat cheese melts and is incorporated. Add a little bit of the reserved tapioca flour mixture to the pan to thicken the sauce a bit if desired, whisking constantly. Add the tarragon leaves and stir to incorporate. 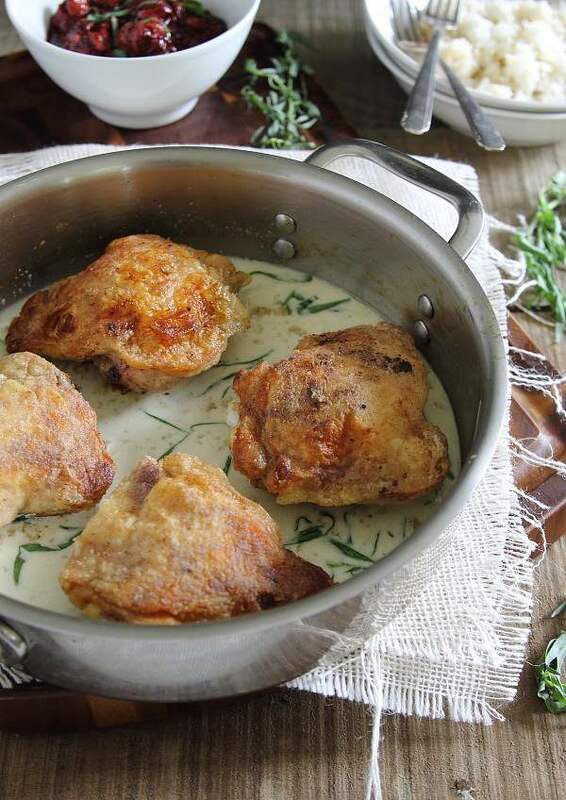 Return the chicken to the skillet and coat in the sauce. 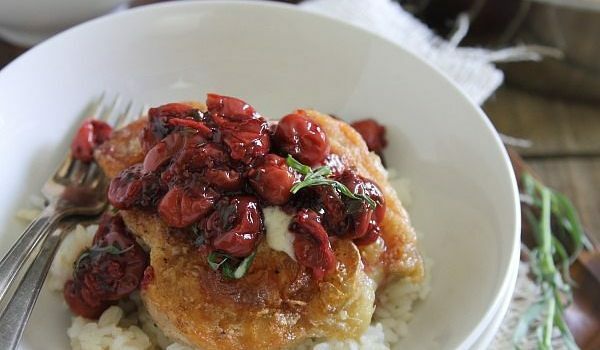 Serve over rice and top with the cherry sauce. Add the olive oil to a small sauce pot over medium-high heat. Once hot, add the garlic and cook for about 30 seconds until fragrant. Add the cherries and tarragon to the pot and cook over medium heat for about 5 minutes. Add the chia seeds, stir and cook over medium-low heat for about 10-15 minutes until the sauce is reduced and thickened. Turn heat off and let sit until serving, it will thicken further as it cools. Okay, whoa. This sounds INCREDIBLE. I’m all about goat cheese lately….and fried chicken? Always. That cherry tarragon sauce is blowin’ my mind! Pinned! Wow, that’s amazing. Cherries + goat cheese on fried chicken? Mind-blowing. I must try this. 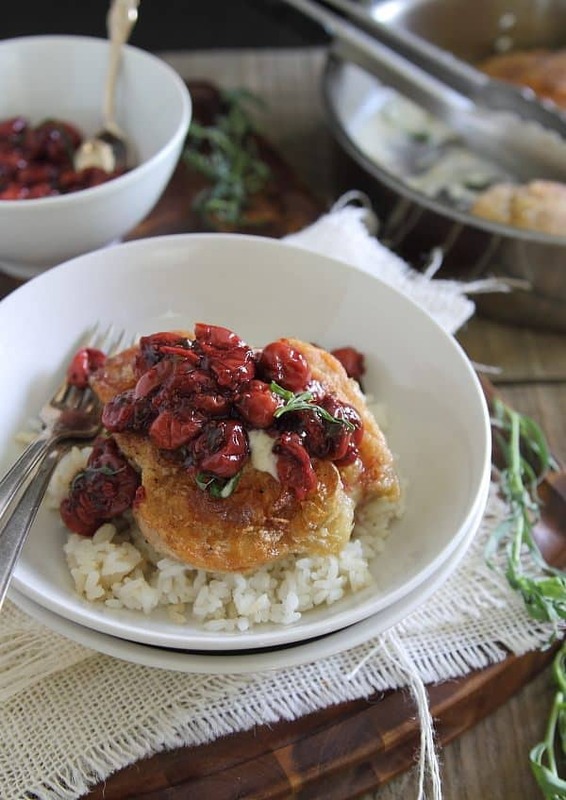 Not only does this dish look beautiful, it includes three of my favorite things – chicken, cherries and goat cheese! Can’t wait to try this! You should make this again and we can pack it for lunch on our road trip….haha. This looks amazing! It does look like a $28 dish! That sauce looks divine. And don’t get me started on the crispy skin!!! The chicken looks perfectly crisp! And the goat cheese with tart cherries…yum!!! You’re easily the most innovative, creative food blogger I follow. I LOVE your recipes.